We’re working on some final preparations for Note CAMP that’s upcoming. For those that are interested you can check out NoteCamp.Live. It is always interesting trying to herd 30 plus cats and speakers and some people speaking into another event at the same time, coordinating that to get everybody scheduled in so it’s a win-win for everybody. It looks like it’s being the largest one yet. 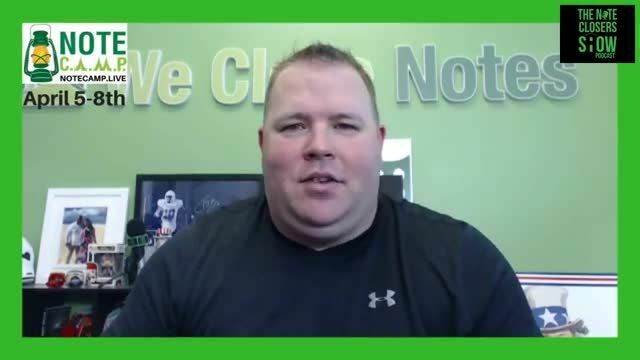 Our topic on the Note Closers Show, I had a couple of people that are new to our note family who want to find a little bit more about my journey, how I got into the note business. I look back at my path into the note industry and what’s happened especially in the last decade and definitely I have learned a lot from my failures more than I have from my successes. I grew up in a small South Texas town. My Dad had a local hardware store, so I grew up with an entrepreneur bug. Went off to college, was going to be the next Dan Patrick from ESPN. That changed as I realized I didn’t really want to do that. I get a business degree. I graduated southwest Texas State University. In 2001 married college sweetheart and I went to work. First job out of college was Enterprise Rent-A-Car, that was a big mistake. I quit that after 90 days and went to work for a couple Verizon Wireless, where I was very, very good at that job. Really led pretty much got to state and activations for a while. Made a lot of money working a lot over time with that aspect but was really good at sales. I was interested in finance, so about that time I’d read the book Rich Dad Poor Dad, and that really set off the entrepreneurial fire inside of the bug, I guess you’d say for many people.